Another chapter in the ancient Madrid folklore will be written today. 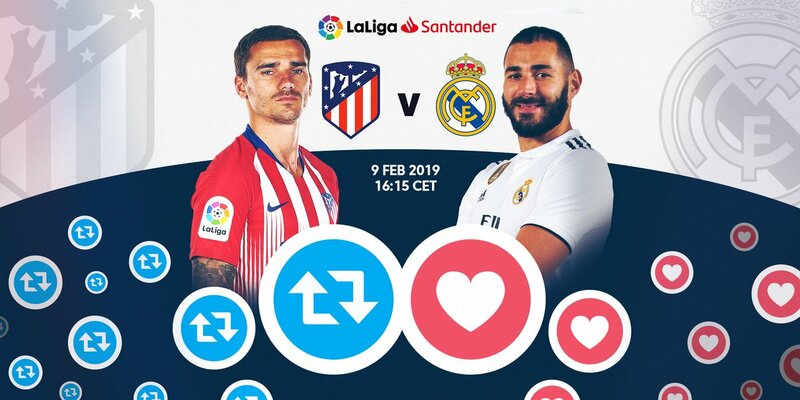 Atletico welcome [sic] Real Madrid to the Wanda Metropolitano with both teams chasing La Liga leaders Barcelona. Although two points better, Diego Simeone’s men must be wary of their rivals' threat. Spain's capital houses five top sides. Getafe, Leganes and Rayo Vallecano have all followed the famous duo up the top-flight ladder. Still, El Derbi is the biggest for madrileños and neutrals alike. There's no love lost between these sides with much more than local pride at stake. Los Blancos goalkeeper Thibaut Courtois and new Rojiblanco striker Alvaro Morata each face their former sides. Bragging rights, history and strife take centre stage. Such is the case since the first official meeting in the Campeonato Regional Centro, a 1-1 draw on 2 December 1906. Since then, 162 duels followed. Real won the lion's share with 86 victories. Atletico picked up 39. After losing the UEFA Super Cup in Morocco, Real held on for a goalless draw at the Santiago Bernabeu in September. El Derbi is a little less enticing than normal this time around these days. Cristiano Ronaldo and Zinedine Zidane are a great miss but both sides form diminishes the contest too. As in recent years, the capital sides trail Barcelona who appear destined for another title. Knocked out of Copa del Rey by Girona and beaten by Real Betis in La Liga last weekend, Atleti must avoid a further slip. The defeat to Los Beticos allows Real an opportunity to leapfrog them in the table. Defeat to the Merengues coupled with a Barcelona win over Athletic Bilbao will pretty much 86 Atleti's slim title hopes. The opposite won't do much for Santiago Solari's young crew, who must follow up the contest with a crucial Copa del Rey semifinal second leg at the Bernabeu midweek. Atleti have been typically tight at the back, conceding 14. Diego Godin and Juanfran have led by example. It's a different tale in the final third. They’ve only scored 32, not good enough for a title challenge. Alvaro Morata was brought in to ease the pressure. He wasn't able against Betis. Real’s attackers are firing on all cylinders. They notched 11 goals in their last five Liga fixtures, yielding maximum points. Solari’s side has hit a real moment of form. The draw in the first leg of the Copa semi at the Camp Nou puts a spring in their step. The same squad that lost 5-1 in El Clasico under Julen Lopetegui put Barca to the test on their home turf following the new gaffer's lead. Karim Benzema, Vinicius Jr and Lucas Vazquez have been aggressively fierce. Not capable of neat link-up play around the opposing back line, they threaten the opposition with long-range shots. Benzema, in particular. The Frenchman’s haul of seven strikes in five matches is a sign of his long-overdue maturity. Solari knows all about his form. “I'm sorry for those who have discovered Karim Benzema last week. But, hey, they still have time to enjoy him. He is in a great moment, it's true." With such a remarkable streak, Gareth Bale will most likely watch from the bench. Isco won't even get a seat owing to an alleged back injury suffered in training on Friday. Fellow midfielder Marcos Llorente is ruled out too with a muscle strain. For Atletico, Koke and Diego Costa play no part due to injury. Saul Niguez is expected to return, having missed last week’s 1-0 defeat. Similarly, Godin has been passed fit to feature. Verdict: Both managers will be extremely cautious in their approach, pointing towards another stalemate of which the Blaugrana will only too gladly take advantage.